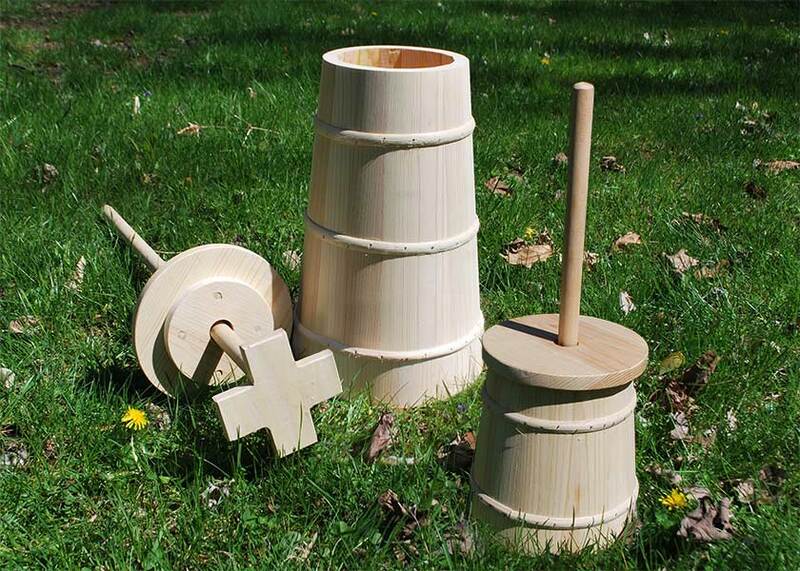 These all wood butter churns are functional, wax lined, and easy to use. The Cross style dasher screws into a wooden handle and easily removable for cleaning. The large churn is 17-inches tall with a base of 11-inches wide, holds approximately 3 gallons of liquid. The small churn is 9-inches tall with a base of 9.5-inches wide and holds about one gallon of liquid. This entry was posted in Churns, products and tagged 18th century, butter, camp furniture, churn, dairy, handmade, historical, historically accurate, homesteading, living history, reenactment, rendezvous, wood. Bookmark the permalink.